Ecstasy is a hallucinogen related to amphetamines. It is a chemical (methylenedioxymeth-amphetamine or MDMA) made in drug labs. Ecstasy is also called E, XTC, Adam, Euphoria, X, MDM and Love Doves. Ecstasy is popular at “rave” parties, all-night dances often held in abandoned warehouses. Ecstasy usually comes in gelatin capsules or tablets. The tablets are small, can be any color, and may have a dove, a hammer and sickle, or a diamond on one side. Ecstasy can also come in a powder, which is snorted or dissolved and injected. When you buy Ecstasy, you may really be getting other drugs. For example, dealers often mix Ecstasy with LSD in a practice known as “candy-flipping.” As with other illegal drugs, it is impossible to know how safe Ecstasy will be, or what effects you might experience. Possessing, producing, and trafficking in Ecstasy can result in fines, prison sentences and criminal records. “Herbal ecstacy” (misspelled on purpose to set it apart from MDMA) is supposed to be a natural and legal alternative. It is a blend of herbs that usually includes ephedra (a basis for some asthma medications) and caffeine. Users often think that because it is “natural,” it is safe. At high doses, however, ephedra can cause heart problems. It is also dangerous to take ephedra if you are on certain antidepressant drugs. You can feel the effects of Ecstasy about 20 to 40 minutes after taking it. The high can last 4 to 6 hours. 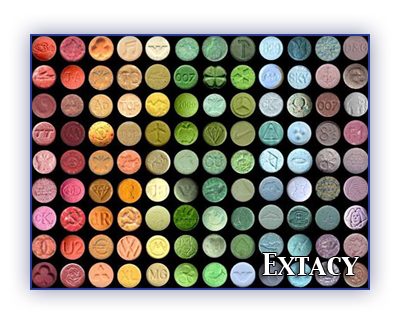 Ecstasy can make you feel mildly intoxicated, relaxed and energetic. Ravers say Ecstasy lets them dance for hours on end. You feel trusting, loving and warm towards others. You may feel that you are experiencing spiritual insights. Ecstasy also makes sensations stronger (especially touch). Ecstasy can also cause jaw clenching, teeth grinding, anxiety or panic attacks, blurred vision, vomiting, and increased sweating, blood pressure and heart rate. It may cause depression, irritability, poor concentration, forgetfulness, exhaustion and paranoia (delusions of persecution). These effects can last for several days. Ecstasy has been involved in deaths due to severe dehydration and heat exhaustion, abnormal heart rhythms and liver failure. Ravers can reduce these risks by taking breaks and drinking plenty of non-alcoholic beverages. There is evidence that high doses of Ecstasy can damage brain cells. Using Ecstasy for a long time may also cause permanent chemical changes in your brain. These changes can mean that your mood and sleep are disturbed for a long time after you stop using. Some regular users become irritable, paranoid, or depressed. They may experience flashbacks or psychosis. Repeated use can damage your liver. If you use drugs often, you can develop serious personal problems. Using drugs can become more important than your family and friends. You may continue using even when your job or schoolwork is suffering, or when you run into financial, spiritual or legal problems. Young people who use drugs heavily may not learn how to solve problems, handle their emotions, and become mature, responsible adults. People who use Ecstasy regularly for several weeks or months need larger amounts to feel the same effects. There is little information on whether Ecstasy produces dependence or withdrawal symptoms if regular use stops.